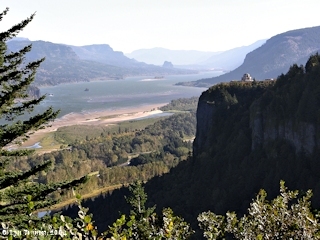 Click image to enlarge Looking towards the Columbia River Gorge, Crown Point, and Vista House, with Washington State and Oregon. View from The Portland Womans Forum Scenic View (formerly Chanticleer Point), Oregon. Image taken October 11, 2004. Many theories as to the meaning of "Oregon" exist. In 1765 an English Army Officer, Major Robert Rogers, used the term "Ouragon" (and later "Ourigan") in petitioning for an exploring expedition into the country west of the Great Lakes. In 1766 and 1767 Jonathan Carver, while exploring among the Indians of Minnesota, wrote about a Great River of the West and he called it "Oregon", possibly after Rogers. In 1863 Father Blanchet, in an article for the "Oregonian", says "Oregon" is from the Spanish word "orejon", meaning "big ears". "Major Rogers, in 1765, said that the Indians called the then mythical river flowing into the always mythical Straits of Anian the Ouragon; and his later spelling (["Ourigan"] in 1772) is probably merely a careless reiteration of the same nameGranting that tale to be true does not mean that this was a name current among the Rocky mountain or the Plains tribes, or those of Minnesota. It might rather have been a name applied by the Mohawks, or some other ot the Iroquoian tribes of New York or Canada. WIth them it would not have been a name currently used, but one mentioned only in response to inquiry, or by some retired canoeman or trapper; and might have been a French name. The French had been going into the MIssissippi valley and to the region of lake Winnipeg and its tributary streams for many years prior to 1760: They were the forerunners of exploration and trade in those regions, and the Iroquois who accompanied them necessarily heard and used words of the French tongue. In the application of place names it was the custom of Indians to use a name descriptive of some physical feature of a stream, or of the locality through which it flowed, and the same custom prevailed among the French. When the French bestowed a name they did so either in honor of some sait in their religious calendar, or by some descriptive word. Every state in the Old Northwest and in Old Oregon contains many instances of such nomenclature. The name Ouragon is practically the same as Ouragan, a word to be found in any French dictionary meaning windstorm, hurricane or tornado. The River of the West was, in 1765 et circa, supposed to rise in western Minnesota and to flow westward through Dakota and Montana, where blizzards in winter and toradoes in summer are still known to prevail. And we many carry the analogy still further. It is a meteorological fact that what is known in Oregon as the Chinook Wind does at times exert a remarkable influence even in Montana and Dakota. The River of the West was flowing into the region from which that remarkable wind came and hence called, by some Indians or Frenchmen, the Ouragon. This seems to be the origin of the name OREGON. The map makers of those years did not get hold of the name. It was obscure." Source: T.C. Elliott, 1921, "The Origin of the Name Oregon": IN: "The Quarterly of the Oregon Historical Society", vol. XXII, No. 2, June 1921. "Jonathan Carver, a native New Englander, was a shoemaker by profession. In 1755 at the age of 45 he joined the colonial militia to fight in the French and Indian War. Carver served six years, leaving as a captain in 1761. Determined to explore the western regions the British had recently acquired from the French, Carver taught himself map-making and surveying. In 1766 Carver was hired by Major Robert Rogers then commander of the British garrison at Michilimackinac (present-day northern Michigan), to head an exploring expedition to the Far West. Rogers’ purpose in organizing the expedition was to find an overland route to the Great River of the West (the present-day Columbia River), which Rogers referred to as the “Ouragon.” Rogers believed that the headwaters of the river “Ouragon” could be reached by following the Mississippi River to its source and then crossing the continental divide. Rogers likely gleaned this information about a great western river from Western Cree and Assiniboine peoples who had traveled across the Rocky Mountains or from French Indian and Euro American fur trappers who traded with these Natives of the northern Plains." Source: "The Oregon History Project" website, 2014, "Carver's New Map of North America, 1778. "[Jonathan Carver in 1767] wintered in a log hut not far distant from where the cities Saint Paul and Minneapolis now stand, with only an Iroquois Indian and French-Canadian voyageur as companions. He established friendly relations with the Sioux Indians then residing in that vicinity, and, eleven years later, in London in 1778, published a book in which are recorded his observations and experiences that winter and during the months immediately preceding and following, when he was traveling on the Mississippi River and its tributaries and on Lake Superior. In that book appears the first known record of the word Oregon*, as a name then applied to the river already called "River of the West" but afterwards officially designated Columbia. Thus, before the maritime discoveries of Perez, Heceta or Cuadra, of Cook or Vancouver and of Kendrick or Gray, and before the overland explorations of Mackenzie, David Thompson or Lewis and Clark, the name Oregon was spoken." Source: T.C. Elliott, 1920, "The Strange Case of Jonathan Carver and the Name Oregon": IN: "The Quarterly of the Oregon Historical Society, vol.21, December 1920. "The first definite proposal to name the region Oregon was made by John Floyd of Virginia in his bill for the occupation of the Columbia River country presented in the House of Representatives, January 18, 1822: "When the population of the settlement amounts to two thousand souls, all that portion of the territory of the United States north of the 42d degree of latitude, and west of the Rocky Mountains, is to constitute a territory of the United States, under the name of the Territory of Origon [sic]." ." Source: E.G. Bourne, 1906, "The Travels of Jonathan Carver": IN: "The American Historical Review, vol.XI, no.2, January 1906. ORIGIN OF THE NAME OREGON. "The late Archbishop Blanchet contributed the following interesting paper to the Oregonian in 1863. It will be observed that the Archbishop speaks of himself in the third person: "Jonathan Carver, an English Captain in the wars by which Canada came into the possession of Great Britain, after the peace, left Boston June 6, 1766, crossed the continent to the Pacific, and returned October, 1768. In relating his travels, which were published in 1774 and re-published in 1778, he is the first who makes use of the word Oregon. The origin of that word has never been dicovered in the country. The first Catholic missionaries -- Father Demers, now Bishop of Vancouver Island, and Father Blanchet, now Bishop of Oregon City -- arrived in Oregon in 1838. They traveled through it for many years, from south to north, from west to east, visiting and teaching the numerous tribes of Oregon, Washington Territory, and the British possessions. But in all their various excursions among the Indians they never succeeded in finding the origin of the word Oregon. Now it appears that what could not be found in Oregon has been discovered by Archbishop Blanchet in Bolivia when he visited that country, Chili, and Peru, in 1855 and 1857. The word Oregon, in his opinion, most undoubtedly had its root in the Spanish word Oreja, (ear,) and came from the qualifying word Orejon, (big ear.) For it is probable that the Spaniards, who first discovered and visited the country, when they saw the Indians with big ears, enlarged by the load of ornaments, were naturally inclined to call them orejon, (big ears.) The nickname first given to the Indians became also the name of the country. This explains how Capt. Carver got it and first made use of it. But the travelers, perhaps Carver himself, not knowing the Spanish language nor the peculiar pronumciation of the j in Spanish, for facility sake, would have written it and pronounced it Oregon, instead of Orejon, in changing the j to g. Such, in all probability, must be the origin of the word Oregon. It comes from the Spanish word Orejon. This discovery is due, in justice, to the learned Dr. George Haygarth, A.M.M.D., of London, a man well versed in the Spanish, whom the Archbishop met in La Paz, Bolivia. So much for the etymology of the word Oregon. This probably becomes a conviction when we consider how customary it is for travelers in a new country to give appropriate names and how generally these names are received, retained, and pass to posterity. We have not a few instances of this practice on the Pacific coast and in Oregon in particular." Source: New York Times archives website, 2014, "The New York Times", March 8, 1884, reprinted from "The Oregonian", 1863.